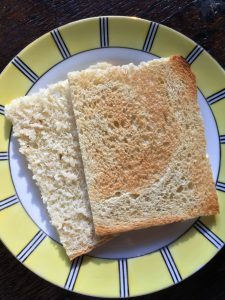 Our recipe for Butter Topped Toasting White Sandwich Bread bakes into a billowy loaf with a hint of sweetness and flecks of wheat germ. 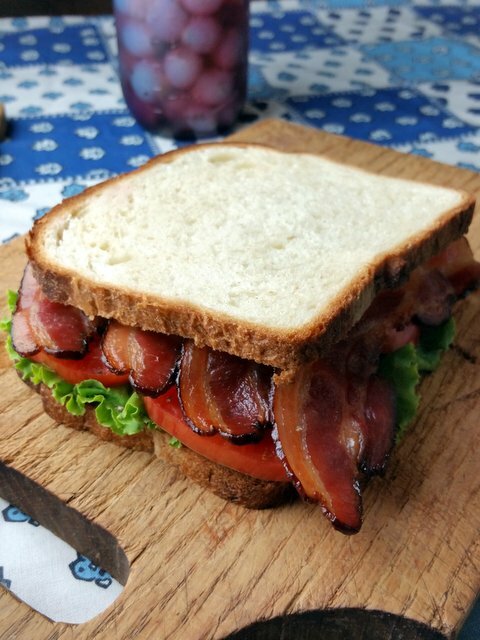 We use it to make BLT’s, tea sandwiches, toast, grilled cheese and Melba toast. This is Bread Makes the Meal Project Week Two. This project is about encouraging you to bake bread at home so that you can share it at any meal. Many of us grew up eating sliced white bread that came in a plastic bag. 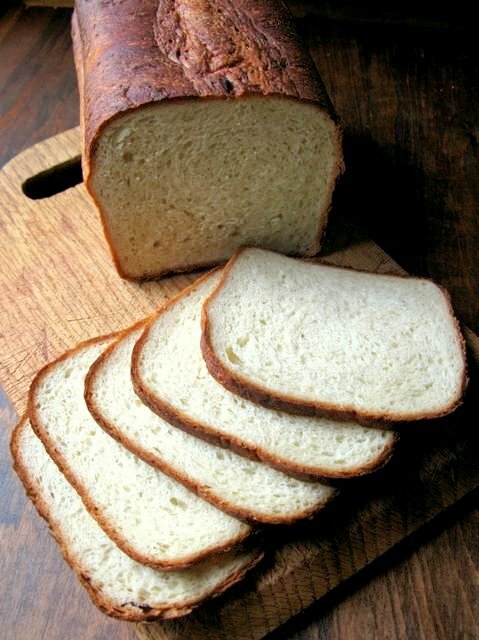 My Polish-born grandmother, whose first job was in a hotel kitchen in Pennsylvania, made bread like this Toasting White. When she came to our house for the holidays, she brought two small loaves. We consumed one with the meal but reserved the second to eat the next day when we’d devour ham, roast beef or turkey sandwiches on it. She kneaded the dough by hand and I recommend that you try that once too. You can see the step-by-step process of mixing this dough by hand here. 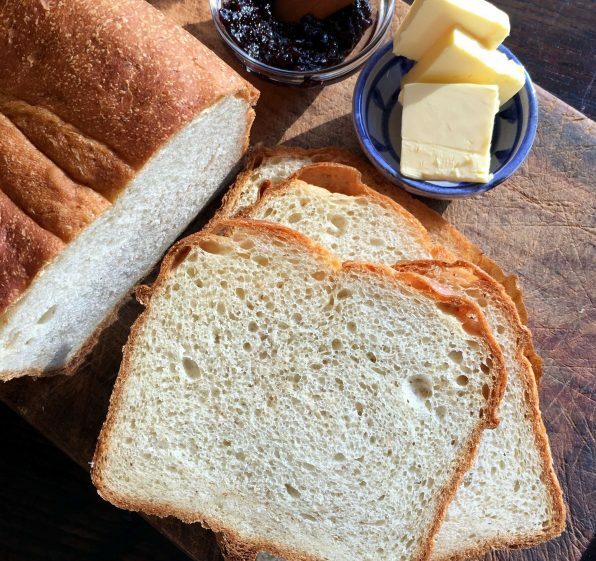 Although I now always mix this bread in a stand mixer as in the recipe below, I find kneading by hand a great way to literally get a feel for bread dough. Authentic Melba toast is a marvelous thing. It’s made from a thick slice of bread that you toast. Then you trim the crust and slice it in half horizontally. I like to spread the soft untoasted side with butter then top it with smoked salmon or sliced cucumbers seasoned with salt and white pepper. Here’s a photo of real Melba toast made from one thick slice of this bread that I split in half horizontally after toasting. Pour the water into the bowl of a stand mixer fitted with the dough hook. Add the yeast and let it dissolve for 5 minutes. Add the flour, salt, wheat germ, sugar and melted butter. Knead the dough for 4 to 5 minutes on low speed. The dough will start to form a ball but will still be sticky and will adhere to the sides of the bowl. Scrape down the sides of the bowl with a spatula. Knead a few more minutes until the dough is smooth and forms a ball. It will be soft and elastic. Place the dough into a greased bowl. Let it rise for 2 to 3 hours until more than doubled in bulk. Press down the dough. Form it into a tight ball then roll it into a loaf shape. Place it, seam side down, into the prepared loaf pan. Let the dough proof until it has expanded 1 ½ times in size, for approximately 30 minutes to an hour. Thirty minutes before baking, place a small pan for water on the lowest oven rack. Position a second rack in the middle of your oven. Preheat the oven to 400°F. Brush the surface of the dough with melted butter. Using a serrated knife, score the surface of the loaf lengthwise. Place the pan in the oven. Pour about ½ cup of hot water into the pan on the bottom of the oven. Bake for 35 to 40 minutes. The bread will be deep brown and well risen. Place the pan on a wire rack to cool for 10 minutes then unmold the loaf. Leave the loaf on the wire rack until cool. Note: I baked the loaf pictured here in an Emile Henry covered loaf pan. It gives the bread a golden crust. Because there is a lid, you don’t need to add steam to the oven. When using the covered baker, preheat the oven to 450°F. Butter the mold and dust it lightly with flour before using.